Whether yoga, Pilates or Zumba - we guarantee you'll find the right women's fitness clothing and accessories for your favourite sport. In the women´s fitness clothes department we have compiled a wide selection of fashionable yet affordable lady´s fitness clothing for you. Here we offer you top prices on many international articles and bestseller brands such as Adidas, Nike, Reebok, Puma and Asics. 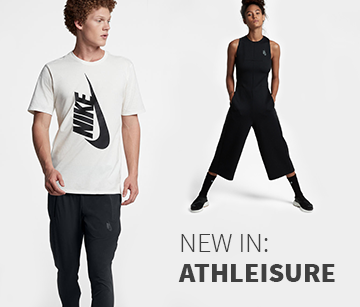 Stylish tank tops, feminine shorts, training pants in different shapes and colours, headbands and wristbands, socks, shoes... our selection of women´s sports clothing is endless and offers something for every taste and look. The sporty styles in our shop don´t just look good, they are also impressively practical. From breathable and waterproof high-tech material to cotton: high-quality clothing for women should keep you feeling fresh and dry even during the toughest workout and should not lose its shape with frequent washing. To ensure the best quality, many sportswear companies use smart materials that have special properties or coatings especially for the women´s fitness clothing range. The properties of the garment can of course vary depending on the sport. During aerobic activity like Zumba, breathability is important, whereas the focus during sports like yoga is always comfort and freedom of movement. No matter which factors are essential for you, in our online shop you will certainly find the perfect ladies´ fitness clothes for you. Every detail of a garment can improve your performance; even choosing exactly the right size is important. A fitted top should not be too tight and not too baggy. Pants should not fall down or squeeze you during sports. The garment where fit is most vital is of course the bra, which is an indispensable piece of clothing for any female athlete. A good sports bra offers optimal moisture management and ensures a high level of breathability. The so called "high-impact Bras" guarantee great stability and support and are therefore particularly suitable for demanding activities such as Zumba or running. You should always make sure that you choose the right cut depending on the sport. Zumba fitness clothing is characterised by a slim fit; while pants, training jackets or T-shirts should have a wider fit for yoga. In our online shop for ladies´ fitness clothing, we offer you a wide range of different cuts of pants. From classic sweatpants, to shorts, leggings or three-quarter pants - all our models offer you plenty of legroom and a comfortable fit. If you are unsure which size and cut you should choose for the clothes for you next Zumba class, don´t despair. Just to turn our team of experts on the chat, who will help you choose not only size and cut but will also give you useful tips regarding new features or technologies of the latest women´s fitness clothes. At Keller Sports you can now order amazing clothes online at a great price without losing out on the best expert advice. This is the ideal way to get yourself kitted out, because we also offer fast free shipping to your home.